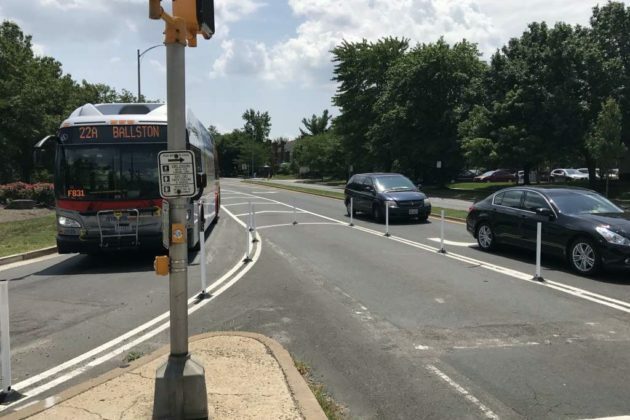 County officials say the reduction of a westbound turn lane on Arlington Mill Drive near Shirlington is a pilot program and the backups it’s causing will be resolved by traffic signal adjustments. Arlington Mill Drive was recently re-striped at the “T” intersection with S. Walter Reed Drive. 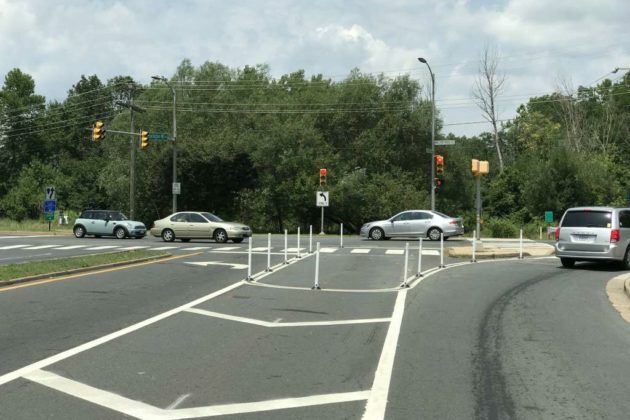 One of the two left turn lanes from Arlington Mill to Walter Reed was removed and blocked off with bollards, a move intended to improve safety for pedestrians and bicyclists. There is heavy bike and pedestrian traffic at the intersection, which connects two sections of the Four Mile Run Trail. Last week a Twitter user also reported significant evening rush hour delays. Also, only half of that line got through the light before it turned red. Before the single line was two, and all cars could get through. In a statement released to ARLnow.com, officials with Arlington County’s Dept. of Environmental Services said that the lane re-striping is a “test” that is being evaluated ahead of a larger intersection improvement project, slated for next year. The test will help traffic engineers determine adjustments to the traffic signal timing, which should alleviate any delays, officials say. Potentially complicating the plan, however: there is already heavy traffic on Walter Reed Drive during the evening rush hour, which could be exacerbated by changes to the traffic light cycle. The full statement from DES, after the jump. The changes at Arlington Mill Drive and Walter Reed Drive are the first steps in the South Walter Reed Drive Improvements project. This intersection experiences a high volume of pedestrians, bicyclists and both heavy and light vehicles. The project, currently in the design phase, will improve safety and transportation facilities for all modes of traffic on Walter Reed Drive between Arlington Mill Drive and Four Mile Run Drive. We are currently testing the lane realignment on Arlington Mill Drive. Notifications about the realignment test installation were sent to residents and stakeholders last month. The test striping has been installed to allow residents the opportunity to try out changes and crossing improvements early and allow staff time to monitor signal operations prior to project construction. 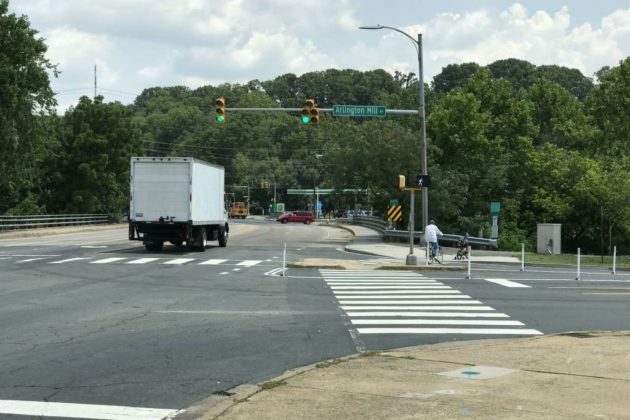 The Arlington Mill lane realignment is a critical piece of the design plan — it enables a significantly larger pedestrian refuge and safer crossing experience for the 600+ pedestrians and bicyclists utilizing the intersection daily. County engineers studied the use and accidents for all traffic at the intersection during the conceptual development phase. 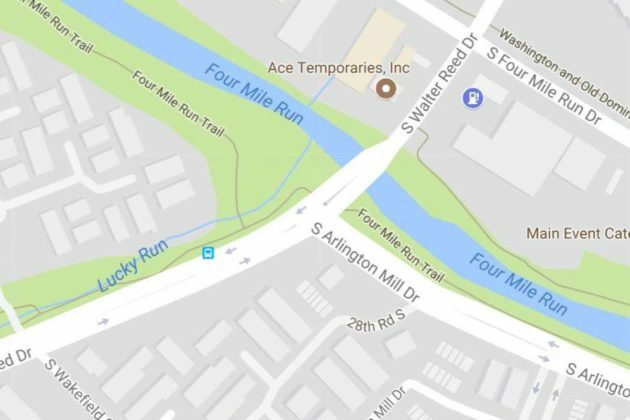 They determined the westbound left turn lanes from Arlington Mill onto Walter Reed could be reduced to one lane to create the larger pedestrian refuge and that operations could be effectively managed with signal adjustments and signage. The County is currently working out signal timings to support the new configuration. Signal operations are an iterative process that require implementation, observation and adjustments until the best timing plans are developed. The County is implementing the lane realignment now in order to test and determine the most appropriate timing plans before project construction. Our engineers are monitoring and making adjustments based on frequent observations. Residents will have the opportunity to share their experiences with the realignment and intersection during a feedback period in August. Additional monitoring and signal adjustments will occur after the feedback period and in the fall once school is back in session. The temporary installation will remain in place and be monitored for approximately six to nine months — or until the start of construction for the improvements project, anticipated to begin in spring 2018. We cannot remove or relocate existing intersection features such as concrete islands, curb ramps and crosswalks during the pilot period, so crews have striped, signed and marked around these features. Drivers are typically more cautious when approaching areas with heavy striping and bollards. 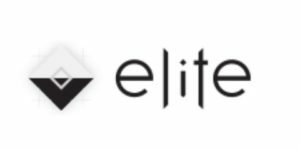 Therefore, the test installation will offer a conservative estimate of operations. Staff expects the final intersection improvements to operate more smoothly than the pilot.